Last year, Amazon accounted for 60% of all online sales in the U.S. If you’re selling on Amazon, you’d be wise to get the most out of your product pages. The smartest way to do this is by creating Amazon enhanced content (or simply A+ content). A+ content pages boost your discoverability on Amazon while also creating a better digital shopping experience for your customers. Vendors now have the option of Basic A+ modules or Premium A+ modules (depending on eligibility). Released in 2018, Premium A+ content allows brands to present their products with more visual appeal and enhanced interactive experiences. What is Amazon A+ Content? Amazon A+ content goes a step beyond essential content by creating a rich online shopping experience. This enhanced content uses different elements to provide all the details online shoppers need to know about a product. Multiple, varied product images, including different angles, close-ups, and lifestyle shots. A short, informative introduction explaining your product in 100 words or fewer. A concise list of bullets, with each line covering a main product feature and benefit. Supporting paragraphs with scannable headers that dive deeper into the features, benefits, and product specs. A “What’s in the Box” section listing all components of the products, so customers know exactly what they’re buying. Other elements may include videos, 360 product views, and a matrix (or comparison chart) for cross-selling items within a product family. Want an example of a successful A+ page in action? Our breakdown of Calphalon’s A+ page shows you how it’s done. What is Premium Amazon A+ Content? Premium A+ content goes a step beyond basic A+ c by creating a rich online shopping experience. This enhanced content uses multiple techniques to creatively provide all the details online shoppers need to know about a product. Enhanced visuals and product images, including 7 modules that feature full-width images. Integrated videos up to three minutes in length and HD quality (720p). Interactive experiences such as hotspot modules that respond to a customer hovering over product features and carousel modules for consumers to scroll through. 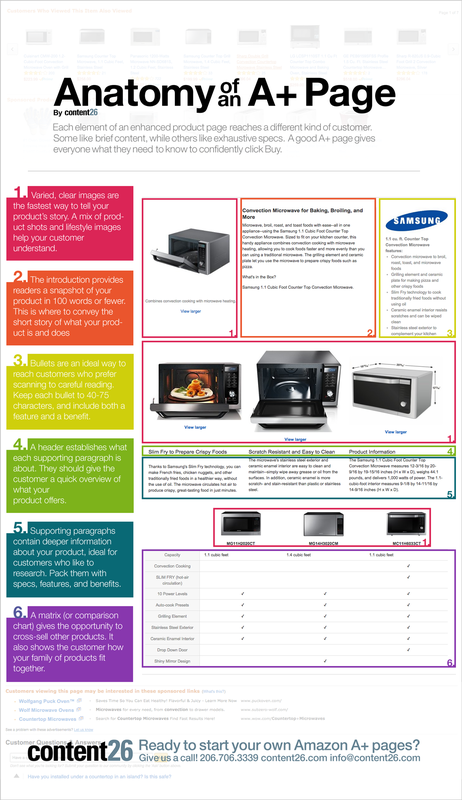 Enhanced FAQ listings that increase consumer confidence with an interactive and engaging layout. Enhanced product pages that are mobile and voice friendly and integrate well with Amazon’s Alexa system. Want an example of a successful Premium A+ page in action? You can view the new features in action on Samsung’s 65-Inch 4K Ultra HD Smart QLED TV product page. Appeals to different shopping styles. Some shoppers scour each paragraph for every detail, while others scan headers and bullet points for a general overview. Images and videos offer a quick impression and appeal to visual learners. Comparison charts help cross-sell and inform shoppers off all the items within a product family. Learn how each element appeals to a different shopping style with our Anatomy of an A+ Page infographic. Creates a full digital shopping experience. Quality A+ content serves as a digital sales and customer service team. Enhanced content builds consumer confidence, minimizes returns, and helps keep customers happy. Successful Amazon A+ content takes skill, that’s where we come in. Our strategic approach to A+ content has boosted online sales for some of the world’s most iconic brands. We understand each step of the content lifecycle on Amazon–content creation, design, delivery, SEO, optimization, and analytics. We also help our clients make sense of Amazon’s extensive content requirements while helping them maintain their brand identity on the site. Editor’s Note: This blog post was updated on October 3, 2018 to reflect new information regarding Premium A+ modules.